Bombay is an arresting place. I say that knowing the irony, because it’s also a place that just does not stop. There’s a constant motion in Bombay, an ever-changing crush of people, objects and aims all laced together in a very tight knot, with you at the very center of it all. It’s also a place that should be experienced to be fully understood. And while most people just want to escape the onslaught as soon as possible, there’s good reason to stick around. If you’re looking for things to do in Bombay, you won’t be disappointed. It definitely has a lot to offer. If you happen to have Bombay (Mumbai) on your RTW trip itinerary, take some time and poke around this vibrant city. Give it at least four days (it takes at least two to uncurl yourself from the cowering ball you reflexively tighten into when you arrive). The series of caves on Elephanta Island are Hindu and Buddhist reliquaries and date back to the 5th century. In 1987 they were inducted into the Unesco World Heritage list of historical sites. In the 17th century the Portuguese took it over and used it to practice firing the cannons that still sit atop it. It takes an hour by boat to motor across the mouth of Thane Creek but the breezes are cool and the view of the Taj Hotel can’t be beat. Pick up a ticket at any of the stalls along Apollo Bandar and the Gateway of India, board the craft and ride with local flow to this most interesting attraction. Boat tickets cost 130Rs (about $3) plus an additional 10Rs (about .20¢) to sit on the upper deck. Boats depart regularly from 9am – 2pm daily. It’s estimated nearly half of the population of Bombay lives in a slum – that’s about 8 million people. Imagine if every man woman and child in New York City lived in a clapboard shack with a palm frond roof and a dirt floor. It’s staggering to think of it. But at the same time 25% percent of the industrial output of the city is manufactured by the people living there. The Dharavi slum alone has an estimated 5000 businesses and 15,000 single room factories. The slums are a way of life, and unless you’re a heartless monster, it’s something that’s likely to change you forever. 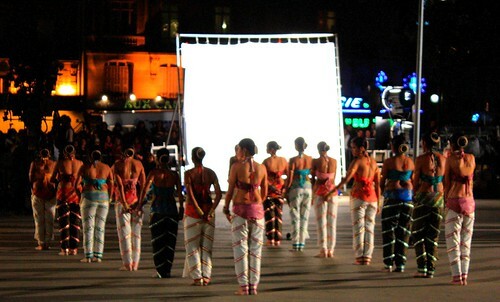 Tours can be arranged by independent businesses or from hotel or guesthouse desks. If you take a taxi driver tour be sure to bargain a negotiated price before you get in, and don’t be pressured to buy something from their friend’s shop should that be part of the deal. Whether or not you think touring slums is tantamount to abject exploitation, it will no doubt help you better understand the life and culture of India. Also, much of the proceeds of the organized tours go to helping the communities they serve. 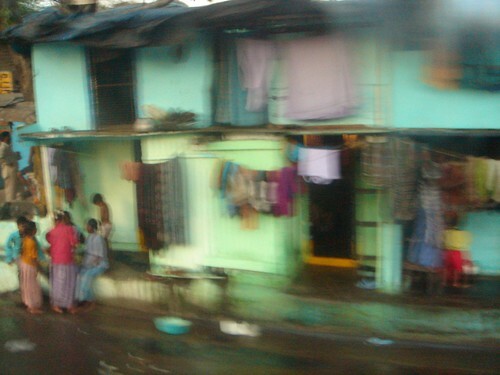 Here’s a great article about what slum tours in Bombay have to offer. Literally, “thieves” bazaar, Chor Bazaar lies just north of the Fort area and the CST station and is one of the largest flea markets in all of India. Noisy, chaotic and crowded, you’ll find everything from car horns to cashmere, Krishnas to clawfoot bathtubs. Even if you’re not looking to buy, just wandering the shop-lined alleys is an adventure in and of itself. Bargaining skills are a requisite – in other words, don’t get taken for a ride. These shop owners are pretty savvy. 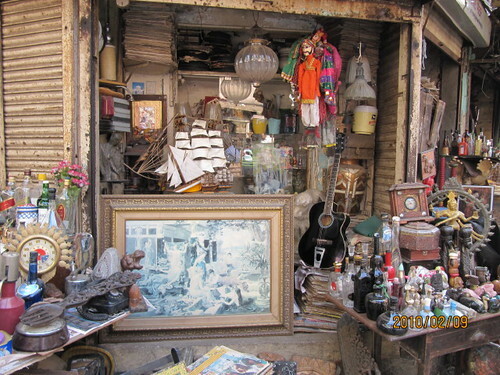 It’s been said if you lose anything in Bombay you can buy it back at the Chor Bazaar, which is at once heartening and disturbing to hear. Located on Mutton St. Open 11 – 7 on usual days, closed on Fridays. Oh, and beware of pickpockets. One of the only recreational beaches in Bombay proper, Chowpatty Beach is a place to escape the fury of the streets. Grab yourself a cane juice, find yourself a spot and hang out for an afternoon. You’ll see a parade of daily Mumbai life: groups of boys sashaying along the promenade pinky-in-pinky, the families entertaining their wide-eyed children and the sun as it alights the sky in full day-glo regalia. 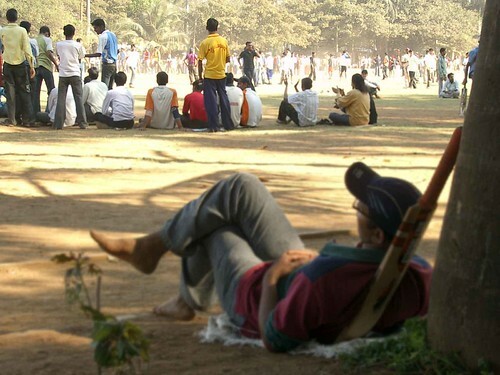 The film industry in Bombay is thriving. At any given time 3 or 4 productions are at work somewhere in the city. Bollywood produces more than 1000 films every year (Hollywood’s number sits around 500) and has a worldwide audience in the neighborhood of 3 billion people. Sadly, much of the acting is wooden, many of the plots are recycled and you quickly realize that for foreigners they are almost completely unwatchable. However! It’s actually possible to be cast in a Bollywood production, whether it’s a simple commercial, a music video, or a full-blown feature film. Scouts often come to the bigger hostels and round up extras by the dozen. It doesn’t pay much, at most 1000 rupees ($20) but it is worth it for the experience, and to see how any sort of complicated production is accomplished in India. Indians, and the local black market, really love cricket tickets. And hence it’s pretty tough to get one for a regular club match in Bombay. But on weekend days the kids come out in force to the Oval Maidan to practice their skills and it’s perfectly free to watch them go at it. While the professionalism may be lacking, the enthusiasm certainly isn’t. Hundreds upon hundreds of teenagers play in dozens of games each overlapping the other in a chaotic mess of flying bats, stumps and balls. Find a spot to sit, take a picnic and watch it all go down. If you would like to add Bombay to your RTW or multi-stop itinerary click on over to TripPlanner. Or contact your Personal Travel Consultant. They’re happy to help. Have your own tips for Bombay? Leave them in the comments section below!